I’m thinking of getting running sleeves…pros/cons? If it is just for the cold, go to target and buy the long crazy socks for $2.50 and cut the toes off. They work great and you can get lots of different ones for a lot less money! I love mine. I use them for my arms and legs. I have a really Lightweight pair from onemoremile They are awesome. I also use compression sleeves on my legs sometimes. Nice too but I do like the thin sleeves. I don’t think there are any cons, lol! I guess one could say price ….they are usually $30 -40/pair. 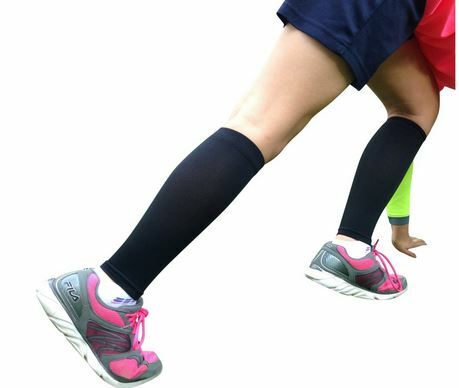 Long socks are not the same as compression wear. They both obviously have a purpose but you won’t get any of the recovery benefits by simply wearing long socks. I use the calf sleeves pretty much all the tine now. I had a very bad calf strain and these aided immensely in recovery. I probably don’t need them as much as I think I do now, but I’ve become accustomed to them and I like how they feel. I agree with Kristine Shelton. First pair of Zensah sleeves I bought at my local running store coat about 50 bucks. Second pair I bought on eBay for 20 which included shipping. Both work very well. I have 3 pairs of zensah compression sleeves and they are pricey unless you buy them on eBay or amazon. I bought 3 weird(ish) colors and I really saved. Great for long runs-6 miles plus. I’ve been fighting a calf strain and shin splint type pain. I wore compression sleeves for my first 10k and I didn’t feel a thing, and recovery was super fast! I’m sold!